Posts Tagged "NY Fashion Week Fall 2015"
Home » Posts Tagged "NY Fashion Week Fall 2015"
Day 5. Seen on Scene. 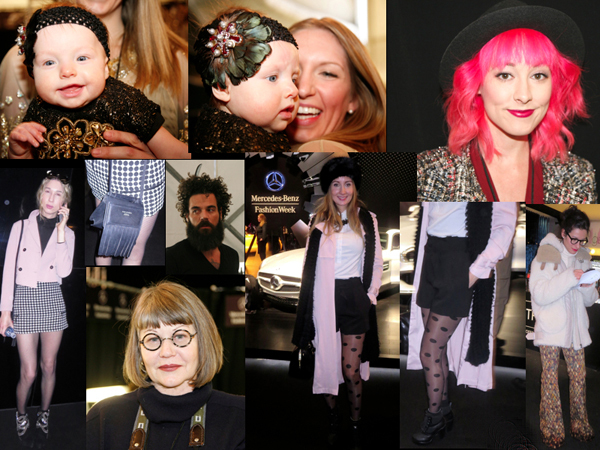 Fab Fashionistas, a baby, fashion designers, fashion stylists, famous photographer and more at Mercedes-Benz New York Fashion Week for Fall 2015, another cold day. Bottom Left to Right: Jade Alred, a freelance fashion stylist, wears a short black and white mini, ornate jeweled booties by Barbara Bui, and that’s her fringed Acne bag to the right … Charlie Price, a hairdresser from Texas wears his comb stuck in his hair when not using it … Trendy polka dotted legs on Sandra Kleine Staarman, (morestylethanfashion.com) from Rotterdam. Her hat and bag are by Ted Baker, shorts are by Asos, blouse by Zara, coat from Forever 21 … thank goodness, the trendy ones are wearing wider pants, here by Rochas, on freelance fashion stylist, Elena Moussa, whose coat is from Acne Studio and turtle neck from Uniqlo … Kyle Ericksen, famous WWD beauty and fashion photographer, wears ’20s-inspired round glasses from Morgenthal Fredericks, perfect, love them on her. Bottom Left to Right: … Fashion Stylist, Betty Gulko (such.a.betty on Instagram) wears her vintage dress layered over a denim shirt and see close up of a headband at the back of her head … Ruby Fang, a designer from Hong Kong uses ancient Chinese embroideries and says she will be showing in NYC soon (rubyfang.com) … Monkey fur vintage coat, Beltmar vintage floppy hat, very 70s, worn by Holly (thriftwares.net) who travels 60,000 miles each year collecting vintage garments, some for the Libertine brand … Marquis Bias, fashion stylist, in a fabulous fur by Adrian Landau, carrying a blue bag by Reed Krakoff (see detail above.) His hair cut by Adrian Fanus Grooming … Beau McCall (beaumcall.com) is a creative artist, just making his visual arts debut. He made his own jacket from a collection of button treasures from family and friends. “A button is more than just a button,” he states. The gloves were a gift inside a Japanese magazine. Day 2. Seen on Scene. Fab fashionistas and a serious fashion alert at Mercedes-Benz for Fall 2015. Bottom Left To Right: Two-Tone dreads are piled on top of the head of Jarrid Jones, a fashion photographer at the Mongol show … Stephan Chung has a great head of hair, worn with leather/jewelry by Phil Harris …. last four photos, fashion/jewelry designer, Phil Harris, in great long peachy orange corduroy coat, with interesting details and very wide tartan pants, plus one rather large earring. Day 1. 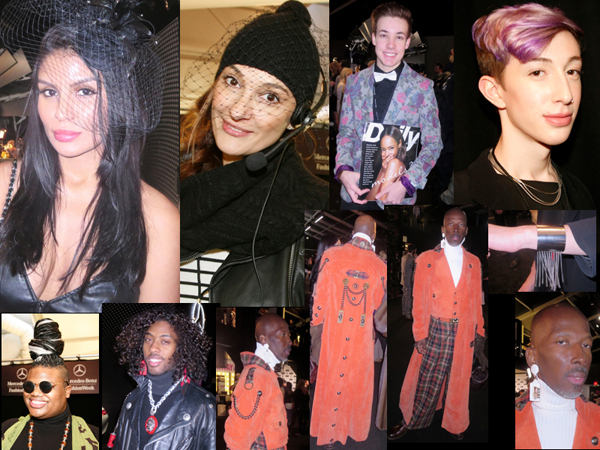 Seen on Scene, Fab Fashionistas, this and that at Mercedes-Benz NY Fashion Week for Fall 2015. 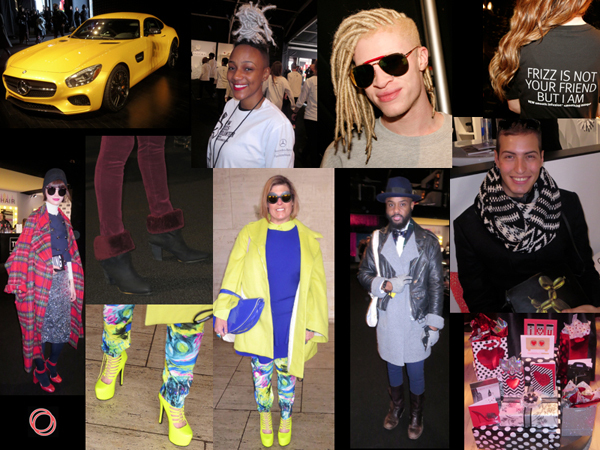 Top Left To Right: The All-New Mercedes-Benz AMG GT S car, “raised on the racetrack, unleashed on the street” in bright yellow, much admired in the Tent Lobby … Fashion Week Volunteer from Nashville with fake dreads … Shaun Ross, actor, dancer, first albino male model, rushing to the great Nicholas K show … “Frizz Is Not Your Friend But I Am” Aveda T-Shirt worn by Tana Tricarichi and makeup crew at the Costello Tagliapietra show. Bottom Left to Right: Song Kyang in her Pushbutton tartan coat, sliver skirt …Teresa Freeman is colorful on a dull day in her Go James shoes and winter brights with a vintage bag …. Lonnie McQuarters in his Thom Browne white shirt worn with a grey Anne Taylor cardigan, vintage motorcycle jacket, Zara gloves, Ralph Lauren bow tie …. love the black and white Bershka man’s scarf on Rom Aloni, sitting in the Tide booth …. Papyrus Valentine’s Day Cards on display in the Lobby – one given away, clever promotion.